Whether it’s the mayonnaise-based potato salads that I remember having so often as a boy, or the olive oil based potato salads that I prepare these days for my mayonnaise-loathing husband and our friends and family, I love potato salads. Check out all of those ridges, perfect for soaking in a lovely vinaigrette. Typically, I boil the potatoes for my potato salads, but when I want something special, especially in the cooler spring months, I like to roast the potatoes. I think roasting potatoes give them more flavor than boiling them. In thinking about how I could make a roasted potato salad even more special, I recalled having recently made a batch of Hasselback Potatoes. Hasselback Potatoes are a way of roasting potatoes, which originated in Sweden, that just elevates them and makes them extra special and festive. 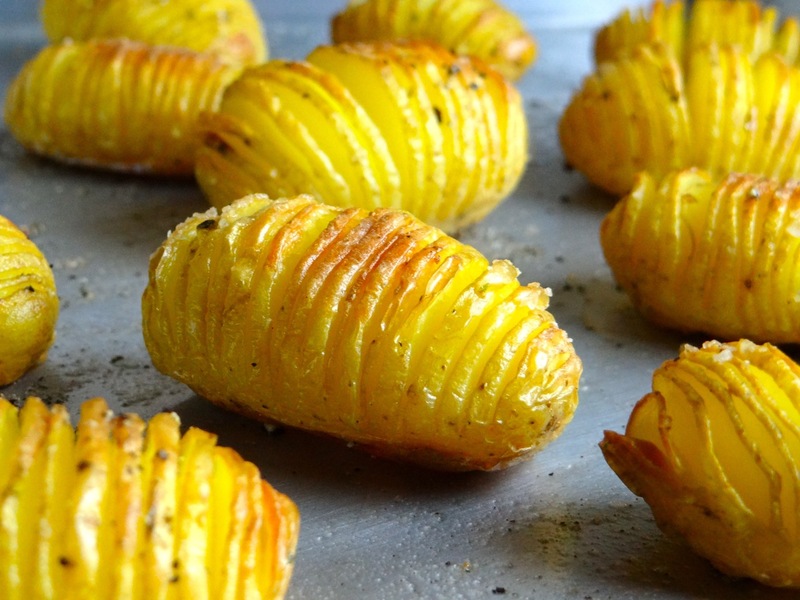 I thought that the ridges of Hasselback Potatoes would be perfect for soaking in a citrusy lemon vinaigrette and all the lovely pungency of rosemary and garlic. Using a razor-sharp knife, cut slices in the potatoes several millimeters apart without slicing all the way the through. Leave about a 1/4″ base at the bottom of each potato. Place the potatoes on a baking sheet, lined with parchment if you wish. Pour 3 tablespoons olive oil onto the potatoes and season them with 1/2 teaspoon sea salt and 1/2 teaspoon pepper. Use clean hands to slick the surface of each of the potatoes with the oil. Bake in the center of the oven for 35-40 minutes, turning the potatoes halfway through, until golden brown and cooked through. Meanwhile, make the vinaigrette. To make the vinaigrette, whisk the lemon juice, 3 tablespoons of olive oil, the minced garlic, 1 tablespoon chopped rosemary, 3/4 teaspoon of sea salt and 1/2 teaspoon pepper in a small bowl. Once the potatoes have fully cooked, add them to a medium-sized mixing bowl. Drizzle on the dressing and gently stir. Check for seasonings, adding more salt if necessary. Toss in the remaining rosemary and serve. Use a really sharp vegetable knife to make slices into the potatoes, it makes all the difference. You can also rest the potatoes between two wooden chopsticks to prevent you from slicing all the way through them.